The Adirondack region is known for being a summer fun destination, and our Lake George resort activities provide on-site recreation options all summer long! From barbeques, fireworks and s’mores, to kid-friendly activities like swimming, fishing, paddleboats, a playground and a sandy beach. There is always something to do at Marine Village Resort! 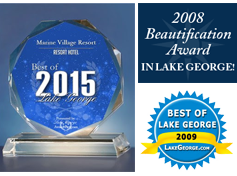 Marine Village Lake George Resort offers the best location of any on-lake facility. We are directly on the lake and in the heart of the village. You can walk to many shops and attractions. Treat your soul to picturesque sunrises, sunsets and moonbeams upon the clear, clean waters of the private beach of our Lake George resort. 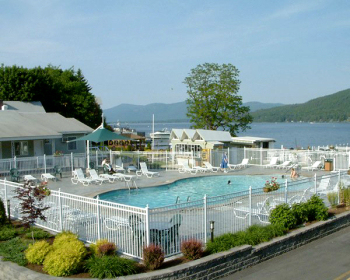 We help mother nature’s plush Lake George setting with groomed landscaping and meticulously kept grounds. Your choice….enjoy our large 30’x55′ heated pool or the sparkling Lake George waters from our private 300′ natural sand beach. Canoes, kayaks, and paddle boats are available from dawn to dusk for a small fee. Bring your pole and enjoy fishing in Lake George. The new playground is now open, offering fun for the little ones! 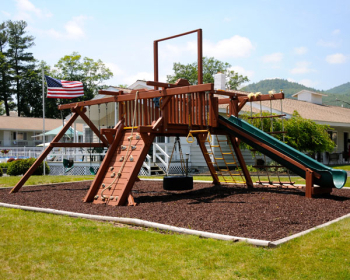 Swings, a slide, and other fun activities await you here! Our on-premises restaurant, The Morgan, is open daily for breakfast full-time from July 1st to Labor Day, and on limited weekends through September.